Is your bestie struggling with her newly bought Windows 8 interface and looking for a seasoned guide from you? Well, instead of wasting hours on manual explanation it’s best to send her video tutorials carrying the illustrations so that she can learn at her own pace. You have the screen capture programs to help you here but not all can assure you complete customer satisfaction. You have to follow the expert review here and when it comes to premium screen capture on Windows 8– the experts generally vote for Movavi Screen Capture Studio. Why? Here goes a brief review on the product. One of the best bits about the Movavi software is that it allows you to customize the screen capture as per your preferred parameters. If you want the best professional presentation, you can set the frame rate at 60fps while you are also permitted to lower the rate to 30-50 fps. You will be able to select capture area at your own will & record the audio too from output & input sound devices simultaneously. With the Movavi program you can make the screencast better informative by highlighting mouse cursor & capturing keyboard actions through clicks on corresponding icons. You would just need to set the timer and the program will continue with the capture on its own and automatically stop as the set time gets over. You will even be able to edit the captured screen for a more personalized and effective view for your friend. The Movavi product allows users to -split the capture in various segments, trim the recording, introduce transitions in between segments, incorporate titles, background music and even work with the special effects. 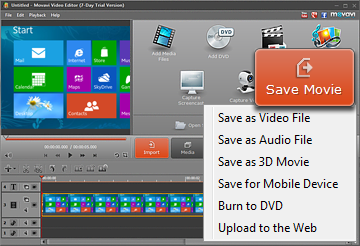 The Movavi Screen Capture Studio allows you to save the recording in all the popular multi-media formats. The Movavi program allows you to share the recorded Windows 8 tutorial online as well. Last but not the least, Movavi is a seasoned brand operating since 2004. The brand covers a huge client base covering 150 and such a vast international acknowledgement assures the high performance quotient of its programs. Audi Service and Maintenance Tips Finding Somewhere For Your Tools To Live!